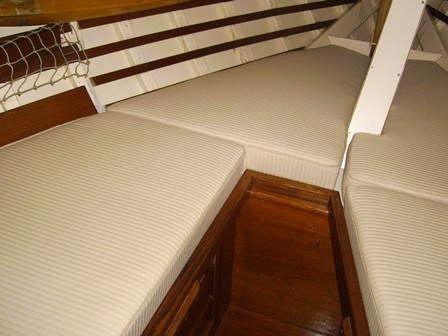 Marine upholstery needs to be comfortable, practical and aesthetically pleasing. 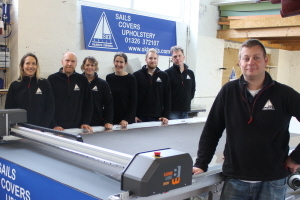 Fine upholstery can turn a boat into a home from home and here at SKB Sails we aim to enhance your boat with the quality and craftsmanship of our work. We offer a wide variety of marine upholstery cloth from hard wearing acrylics and contract vinyl to the superyacht preferred ‘Sunbrella’ seating fabrics. We can also provide a bespoke foam tailoring service offering a variety of foam densities and laminated options. 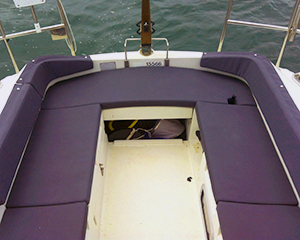 We can create seating and sleeping solutions suitable for any area of your boat, be it flybridge, RIB helm seats, cockpit and saloon seating or cabin bunk cushions. When designing new upholstery we will come to your boat for patterning to ensure that the finished foams and cushions will be exactly tailored to the lines of each cabin and ensure that the finished articles are a perfect fit. 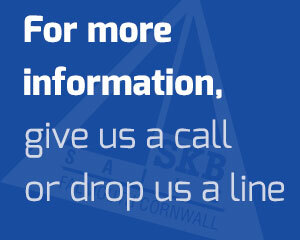 If you are happy with your existing foams we are also happy to re-cover.